Location : Mauja/Sildujure VDC, Kaski District. RL of Intake : 1007.07 m.
Hard Rock Cutting for Laying 300 mm DI Pipe. Location : Chilaune Danda Kalika VDC of Kaski District. ADB Mission Visit Program at Lapsidanda RVT. 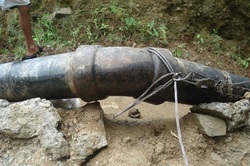 250 mm DI Pipe Maintenance work after damaged by Landslide at Lamakhet Area of Kalika VDC, ward no. 8. 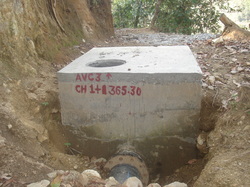 Air Valve Chamber at Transmission Pipeline. 300 mm DI Pipe Leakage due to Landslide at downstream site of Intake. Name : Distribution Chamber during Construction.